Chiffon cakes are one of my favorite things. So it's part of my regular programming to make one. I was getting ready to make my favorite, a classic "plain" vanilla one, the other day when I saw an orange version from Martha. I've always wanted to make an orange chiffon cake and since I've enjoyed other occasions where I branched out, I made the orange version. I have no regrets! I think of this as one big, bright, bouncy orange chiffon cake. It's just as it should be - lofty, fluffy, light and moist. Orange zest and fresh orange juice give it plenty of flavor so there's no doubt it's an orange chiffon cake. Adding citrus is a small way of adding some sunshine and brightness to these winter days. I think we can all lighten and brighten our moods a bit with our food. This is a great cake for January, before we bring on the richer chocolate treats for February and Valentine's Day. You are planning on making some chocolate treats, aren't you? It's hard to believe we're already at the tail end of January already. Once upon a time, I thought the first month of the year dragged on but as I get older, time flies out the door and vanishes somehow. Nevertheless, there's still a few days left to the month. If you're in the mood for cake, I'm offering this as my suggestion. I love that moment when I pull a finished chiffon cake out of the oven. It smells amazing and I am always amazed by the transformation in the oven. This one has 6 whole eggs in it. The egg whites and baking powder lift it nearly to the top of my big tube pan. 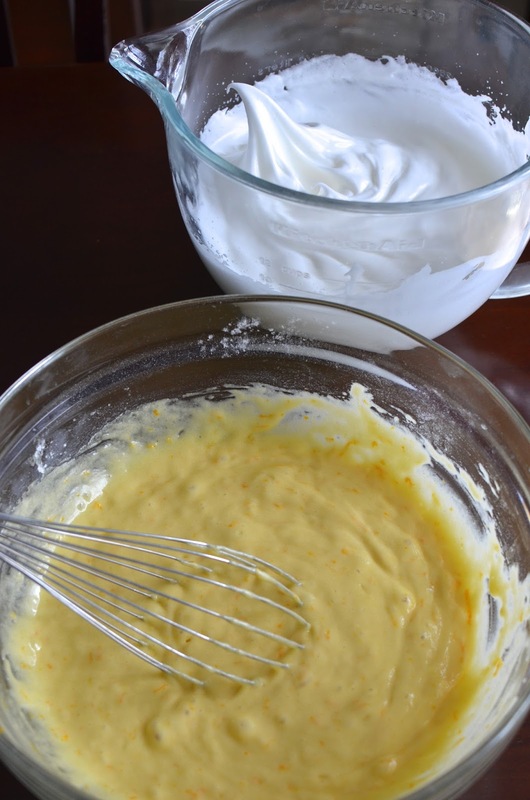 You can see the yellow-orange tone of the cake batter from the egg yolks and oranges. It's almost hard to imagine how these two bowls below combine to make the cake above. It's one big bouncy cake, making plenty for sharing. I also love how it stays moist for several days. Just wrap it tightly in plastic wrap and store it at room temperature. I cut myself a slice...and usually go back for seconds. Preheat oven to 325 degrees with a rack positioned in the middle position. In a large bowl, whisk together the flour, baking powder, salt, and 1 cup of sugar. Make a well in the center of the mixture. Add oil, egg yolks, orange zest and juice, as well as the water. Whisk together, starting in the center, and working your way out to fully incorporate the batter. Place egg whites and cream of tartar into the bowl of a stand mixer fitted with a whisk attachment. Beat on medium-high speed until soft peaks, then gradually add the remaining 1/2 cup of sugar, about a tablespoon at a time, until stiff peaks form. Using a large rubber spatula, fold half the beaten egg whites into the batter. Fold in the remaining whites until just combined (to avoid deflating the whites). Pour batter into a 10-cup angel food cake pan or tube pan, smoothing the top. Bake until a cake tester inserted into the center comes out clean, approximately 50-60 minutes. Remove pan from the oven and invert (either on its legs if the pan has them or set the cake pan upside down over a heavy bottle) to cool completely. Remove the cake by running a sharp knife around the sides of the pan, angling the knife towards the pan to try and keep the crust intact. Your orange chiffon is perfect, Monica. It looks so light and soft! Thanks so much, Angie. It is most definitely light and soft! Chiffons are one of my favorites, for sure. Thank you! Damn delicious citrusy chiffon cake!!! Hi Monica, I have never made a chiffon cake before, this looks so light and delicious. I hope you try it one day, Cheri. It is one of my favorites...easy to make and so light yet satisfying! Hello Monica! What a lovely cake! I love it! I'm dying to give your recipe a try! Glad you like it, thank you, Marcela! Oh wow, this looks amazing! I love orange flavor in my cake but have never made a chiffon cake. haha - I love your attitude; your "realness" totally comes across loud and clear! : ) Hope you have time to try a chiffon one day. It's easy and stays moist for days. Thanks, Ritu. Glad you're a fan of it, too. I cannot get enough of orange zest in baking right now! I've even been putting it in my oatmeal! (which is not baking but you get my point :) ) This cake looks absolutely delicious! Hope you are having a great weekend! What a beautiful chiffon cake! I love the citrus flavours. I also love the moment you pull a chiffon cake out of the oven - I swear the smell is heavenly!! Yes! That moment when you see it's risen and that smell of eggs and vanilla in the air...totally intoxicating! Ooo I might try this with some blood oranges! The citrus infusion must make this such a refreshing sweet treat! What a beautiful cake, Monica! I'm a bit jealous...I cannot get my cakes to rise so beautifully at my altitude. Cake baking is a nightmare and I seriously envy all the sea level bakers! Your cake looks so fluffy and it has such a lovely texture, grant job, Monica! Oh my - not being able to bake cakes would be sad for me these days! Chiffons are wonderful but probably very sensitive to altitude. I'm glad you make up for the trouble with cakes by cooking up all your other wonderful foods. January used to drag but not anymore! I love how chiffon cakes make it look like the baker did something special when it just kinda comes out all fluffy and huge! haha...I always crave it. Chiffon cake is one of my favourite things too, and orange flavoured sounds even more wonderful! I wish my son was more into orange-flavored bakes but I sneak it in as much as possible. Thanks, Aimee. I love chiffon textures - thanks, Lorraine! This looks like a great cake to share at a work-related function. I love the citrus and have never tried making a chiffon cake - what is wrong with me! Hope you are all warm at home - looks like you have a little weather coming your way. We're going to get off easy - just south of DC - maybe an inch? Hope it warms up fast - this has been a dreary winter indeed! Absolutely a great big cake for a crowd...and people tend to be surprised by how light and moist it is. The original chiffon I make is well loved by many and I'm so glad I found the recipe and can make it whenever the urge hits (often). We got lucky with the snow storm! Thank goodness!!! 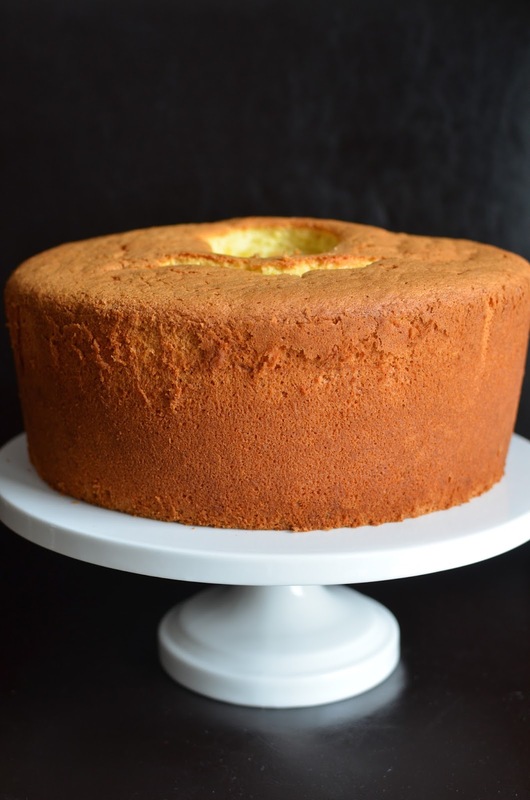 It is one of my favorites - no joke...I make it often and I just love chiffon cakes. Hope you try it one day! I saw this cake on Martha Bakes as well and have been wanting to try it. Looks fantastic! Oh. Em. Gee. This chiffon cake is PERFECT! Just perfect! I want to reach into my screen and have a taste. Nice cake. If you like orange then you can try Orange cake recipe. Instead of orange you can try your favorite fruit also. There's always room for more cake...thanks. This is indeed a perfect chiffon cake for lifting the January gloom Monica! Fabulous flavours and wonderfully light. Bravo! CHIFFONNNNNN! LOVE chiffon cakes: so retro, and yes, SO big and bouncy and way easy to eat seconds (or thirds!) of in one sitting. i love all the orange in there: you can totally see it and i can just imagine how lovely this tastes, particularly at this cold and dreary time of year. You always know how to take things up a notch, my friend! Love that! I cannot agree more Monica! Citrus is so January while chocolate has to be aplenty in February. All great pastry-minds think alike! This cake is so beautiful with the fluffy texture and hint of orange-yellow. My mind is no where on your pastry calibre, Sonali...but thank you! : ) The color cheered me up and eating any chiffon always makes me smile so mission accomplished! A dreamy chiffon cake! Love the flavor here and its so light! This is a keeper for me! Yeah the chocolate and orange goes well together and good thinking! I love your chiffon cake and I'd love to make this one. I love oranges (or any citrus) in sweets! What a perfect chiffon cake. Wish you live near me. I'll go to your baking class. I'm serious! wow its really great chiffon cake recipe i'll try this so yummy thanks for sharing. Glad you like it, thank you. very useful recipe. I found this blog very later but I am glad I did. I am going to try these tips.